For the past decade, El Salvador has regularly experienced record-breaking extreme weather events on both ends of the rainfall spectrum. Two years of unprecedented precipitation from 2009 to 2011 were followed by a drought that lasted from 2012 through 2015. Rainfall patterns are also becoming more unpredictable, leaving parts of the country flooded and others parched. This decade of extreme weather is representative of a longer-term trend. Between the 1960s and 1980, El Salvador saw only one extreme precipitation event, but this number increased to four in the 1990s and to eight in the 2000s. Until the mid-1980s, the annual rainy season generally spanned September to December. But since the mid-1990s, the length of the rainy season has nearly doubled to extend from May through November. During 2014, nearly two-thirds of grain producers reported crop losses due to drought, and many of those lost their entire crop for the year. In 2009–2010 and 2011–2012, coffee production plummeted due to heavy precipitation. Increasing temperatures are also reducing agricultural productivity. Farms in provinces of El Salvador with lower mean temperatures yield almost a ton more maize per hectare than those in hotter regions. This suggests that nationwide yields of this staple will decrease as temperatures continue to rise. Coffee, one of El Salvador’s primary export crops, is even more temperature-sensitive: It cannot grow in warmer temperatures, so the area where coffee can be cultivated is shrinking. 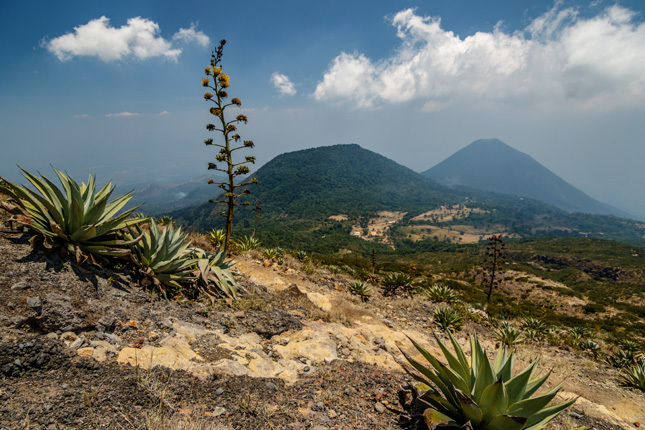 The impacts of extreme weather are exacerbated by the severe soil degradation that characterizes most watersheds in El Salvador. Degraded soil lacks the ability to retain water and regulate water runoff, making floods and river surges more likely and their impacts more severe. As crops fail due to drought, extreme precipitation, and epidemics of coffee rust, rural livelihoods are breaking down and many families are migrating in search of other economic opportunities. This trend is affecting El Salvador’s neighbors in Guatemala and Honduras as well: In 2015, 3.5 million people in the Northern Triangle region were in need of humanitarian assistance due to food insecurity. Urban centers are also hit hard by extreme weather that damages infrastructure, and the consequences are often sudden and devastating. In November 2009, heavy storms caused flooding and landslides in urban areas that resulted in US$315 million of economic loss, or 1.4% of El Salvador’s GDP. The death toll reached 198, and 122,000 people were immediately affected. Strong storms in 2010 and 2011 had similar effects, destroying bridges and roads and causing hundreds of millions of dollars in damage, totaling 4% of GDP. Reconstruction efforts have generally focused on rebuilding what was destroyed rather than improving resilience or creating new stocks of capital, thereby undermining El Salvador’s hopes of creating new jobs for its expanding ranks of the unemployed. In 2008, the U.S. Census Bureau estimated there were 1.1 million foreign-born Salvadorans in the United States. Spikes in immigration from El Salvador have generally been correlated with spikes in that country’s domestic homicide rates, but it is important to note that these high homicide and migration rates also tend to coincide with the extreme precipitation events that are causing so much destruction in El Salvador. For instance, spikes in the two trend lines (homicide rates and migration rates) coincided with the severe drought in 2013–14. This suggests that extreme weather may be playing a role in migration dynamics. Outward migration also intersects with violence and slow economic growth to further destabilize El Salvador. When economic opportunities are limited, gangs and narcotics groups fill the gaps to provide incomes. The expansion of these groups contributes to increased violence, which in turn slows the country’s growth by deterring investment and increasing security costs. The combination of a weak economy and a climate of violence has pushed some 20% of the population to leave the country, with many migrating to the United States. International migration has significantly slowed El Salvador’s population growth over the last two decades. It has also led to a massive inflow of remittances; in 2012, these amounted to 16% of El Salvador’s GDP. In turn, remittances increase reservation wages and lower labor participation rates, decreasing the competitiveness and growth of the economy. The United States has steadily invested in El Salvador, having committed around US$10 billion in military and economic aid between 1980 and 2013. Adding environmental programs to this development package will make existing programs more effective and help ensure U.S. development assistance pays off in the form of increased stability and prosperity. Herman Rosa is the former minister of environment for El Salvador. Chelsea Spangler is a water and security program associate with the World Wildlife Fund-US.